Background: Pharmacotherapy is of increasing interest in peripheral arterial disease (PAD), with novel therapies aiming at different factors contributing to the disease. For antiplatelet therapy, there is no unanimous agreement regarding the nature or duration of optimal antiplatelet therapy so as to reduce major adverse cardiovascular and limb-related events (e.g. repeat interventions and amputations). However, evidence on novel more potent antithrombotic agents, drug combinations and personalized antiplatelet therapy for PAD patients is accumulating. Similarly, statins are now considered as a standard of care in PAD patients, due to their multiple actions which include plaque stabilization, antiinflammatory properties and regression of atheroma. 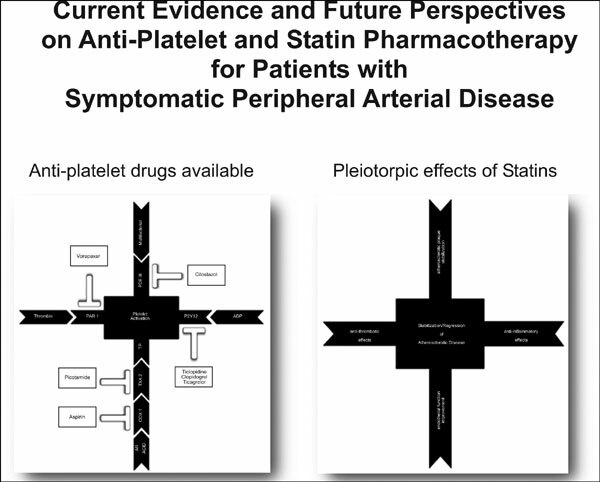 Conclusion: This review focuses on current evidence available for various antiplatelet regimens and statin therapy for PAD and discusses future perspectives. We consider randomized controlled trials, together with the most important reviews and meta-analyses. Treatment algorithms based on currently available data. Keywords: Peripheral arterial disease, antiplatelet therapy, aspirin, statins, clopidogrel, cilostazol, ticagrelor. Keywords:Peripheral arterial disease, antiplatelet therapy, aspirin, statins, clopidogrel, cilostazol, ticagrelor. Abstract:Background: Pharmacotherapy is of increasing interest in peripheral arterial disease (PAD), with novel therapies aiming at different factors contributing to the disease. For antiplatelet therapy, there is no unanimous agreement regarding the nature or duration of optimal antiplatelet therapy so as to reduce major adverse cardiovascular and limb-related events (e.g. repeat interventions and amputations). However, evidence on novel more potent antithrombotic agents, drug combinations and personalized antiplatelet therapy for PAD patients is accumulating. Similarly, statins are now considered as a standard of care in PAD patients, due to their multiple actions which include plaque stabilization, antiinflammatory properties and regression of atheroma.